We’d love your help. Let us know what’s wrong with this preview of Inclusive Design Patterns - Coding Accessibility Into Web Design by Heydon Pickering. Many web design articles and books are all about improving your workflow and making your life easier as a developer. Should you wish to adopt a framework or employ a processor to speed up your development process, be our guest. However, this book is not about you; it’s about your audience. The Inclusive Design Patterns book covers all the techniques, gotchas and strategies Many web design articles and books are all about improving your workflow and making your life easier as a developer. Should you wish to adopt a framework or employ a processor to speed up your development process, be our guest. However, this book is not about you; it’s about your audience. 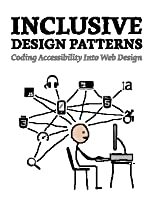 To ask other readers questions about Inclusive Design Patterns - Coding Accessibility Into Web Design, please sign up. Accessibility is one of those topics that can be very intimidating to folks. There is a lot to know and a lot you can get wrong. Plus, since accessibility is felt so personally by many, the reaction to accessibility mistakes online tends to be…unpleasant. It makes a lot of people I’ve talked to feel stuck, not sure how to proceed. Heydon’s book doesn’t attempt to teach you everything you need to know about accessibility. It does something more important: it teaches you how to think about building inclusivity into your application throughout the process of designing and building it. Instead of walking you through a checklist of what to do for each of the various impairments users may have to battle, the book walks you through building different components. For example, there’s a section where it walks through marking up a blog post. Sounds simple, but there’s a lot of thought and care being applied to ensure that the post is accessible: the markup used, how screen readers will interact with the post, transcripts for videos, link labels, reading level and more. As a result, you learn to think critically what you’re building and how different people will want to use it. I have a few minor nitpicks from some of the early performance recommendations, though to be fair the book came out in 2016 and I’m not sure how many of my critiques would’ve been applicable then. They are, also, minor. Nothing he states there is wrong, just a few things that are a bit less than ideal. That minor nit aside, Inclusive Design Patterns is a fantastic resource for any developer—and this should be all of us—who wants to build a web that can be used by everyone. "Everybody is a keyboard user when they are eating with their mouse hand." I did skim/skip the sections on TDD and making paper prototypes as part of the design process as they felt a bit out of place given the topic of the book. This book had some great tips and points to consider when designing a website. However, it was written toward someone who is both a designer and developer. As a UX/UI designer, there were a lot of things I found very valuable, but there was also a lot of coding examples I simply skimmed over. If you're just a designer, I recommend having your developers read it as well and vice versa. I’ve always found the topic of accessiblity an interesting one, and I this book had so many great ideas that I ended up turning it into the basis of a lightning talk at work. I really appreciated that each section started off with typical bad practices, then shows you how to change what you’ve done to make it fully inclusive. It also includes the reasons why what you were doing wasn’t the correct way to go about things, and why their suggested way is better. I found the descriptions of inclusive design particulary enlightening. I’d always just assumed that it was for people with sight problems, but being inclusive is about way more than that. Inclusive means including everyone, regardless of ability (physical or mental). But it also means being inclusive of those on slower/more expensive internet connections (as developers we often forget that not everyone is as lucky as we are in terms of access). 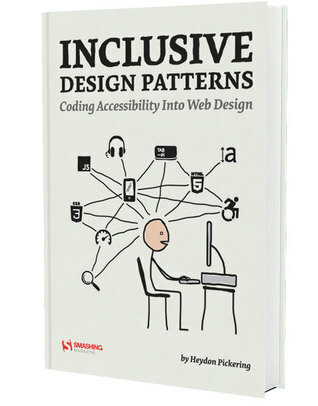 I would highly recommend this book to anyone involved in building websites, even if you think you know everything there is to know about inclusive design, I’m sure that this book will still be able to teach you something. And if you’re a complete novice, the HTML examples given throughout are extremely helpful in making you understand what’s going on. This books is an excellent resource for those who really want to empathize with people with disabilities. It shows how web developers can take small steps to make an application that much more usable. a must read. clear, actionable, defensible approach to making websites and web apps accessible. A good reference source on a complicated topic. Incredible. I only dabble in website development (I can tear down an php file, but if you ask me to rebuild it, I'd come away with some extra else statements). I've been interested in user experience and accessibility from a web design standpoint for a while, but mostly as an appreciator of the way solid, conventional structure simply works so well. There's something inherently interesting about the simplicity of simple things working for as many people as possible. This book takes a few steps be Incredible. I only dabble in website development (I can tear down an php file, but if you ask me to rebuild it, I'd come away with some extra else statements). I've been interested in user experience and accessibility from a web design standpoint for a while, but mostly as an appreciator of the way solid, conventional structure simply works so well. There's something inherently interesting about the simplicity of simple things working for as many people as possible. This book takes a few steps beyond Don't Make Me Think, Revisited: A Common Sense Approach to Web Usability (which is another book that I absolutely recommend), by diving into actual code examples, specifically in terms of how websites should be built to be functional for users with various impairments. The book has some good content but I found the chapter on test driven development underwhelming (and, as usual, at the very end), although testing through CSS selectors is an interesting concept I have learned. There were also some chapters where the author seemed to jump to seemingly unrelated topics which confused me. Some of the code examples use coding anti patterns, only sometimes due to the choice of programming directly against the DOM with no abstraction. I also missed some background in The book has some good content but I found the chapter on test driven development underwhelming (and, as usual, at the very end), although testing through CSS selectors is an interesting concept I have learned. There were also some chapters where the author seemed to jump to seemingly unrelated topics which confused me. Some of the code examples use coding anti patterns, only sometimes due to the choice of programming directly against the DOM with no abstraction. I also missed some background information in the discussed patterns. Only some part of the book is organized by pattern and the text doesn't use familiar pattern format. Very good read, that provides useful tips and a lot of references regarding web accessibility and common design structures. I like how the author explains the importance of using semantically valid elements and correct ARIA attributes. The different design patterns covered in the book are well described, backed up with good arguments. However I found the structure of the book a bit chaotic, without following any specific order, but this is just my preference on the overall presentation. Definitely Very good read, that provides useful tips and a lot of references regarding web accessibility and common design structures.